Layering – It’s A Fall Thing. Taking It Off. Sonäge is thrilled to have seasoned market editor and tastemaker Randi Packard as our “experience curator” — seeking out some of the best things to do, taste, wear, read, enjoy. 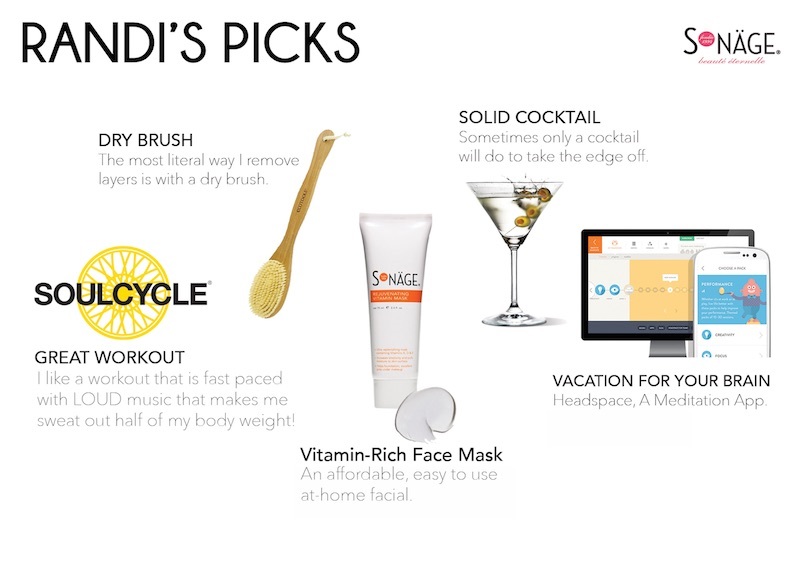 To sample some of Randi’s other picks, visit her Pinterest page. With the arrival of fall, layering becomes second nature. The idea of taking a layer off and putting one back on really speaks to me around this time of year. It implies coziness, attention and self-care, being thoughtful, and even a little naughty. Here are few of my favorite ways to take a layer off. If you missed my “add a layer” selections you can check them out here. Headspace, A Meditation App. When I am super-stressed, yoga just doesn’t cut it. I know, crazy! If I am in a worried state of mind, I can’t concentrate on yoga; my mind wanders too much. Clearly, I need more of the Headspace app. In the meantime, I like a workout that is fast-paced, with LOUD music that makes me sweat out half of my body weight. A spin class is a good fix for me. I like Soul Cycle in particular; they have studios in many of the major cities across America. To take the edge off, sometimes only a cocktail will do. Lately I’ve been enjoying a good vodka martini. Here is my quick, go-to recipe to keep warm, from the inside-out, on those cold, wintery nights. Shake the vodka and vermouth, along with a few ice cubes, in a cocktail shaker until it’s really cold. Then strain it into a martini glass and add the olives. Always add 3 olives ­ no idea why. But, trust me, it works. I consider Sonage’s Rejuvenating Vitamin Mask an affordable, easy-to-use at-home facial alternative. After just 20 minutes on my face (I apply and keep it on while I meditate…OHM…) my skin feels energized and looks dewy and bright. Finally, the most literal way I remove layers is with a dry brush. Before I go to bed, I love to dry brush my skin and then slather body oil on all over before I put on my PJ’s. This EcoTools Bamboo Bristle Bath Brush has a long handle, which is great for reaching hard to get to spots on your back. Whether it’s luxury, travel, accessories or fashion, Randi Packard’s expert eye is sought after by publications and brands alike. As a contributing market editor, Randi is currently lending her experience to such notable publications such as People Style Watch magazine and Real Simple magazine, having previously done so for Lucky magazine, Lucky.com and ArchetypeMe.com. She is also the consulting creative director for a luxury accessories line. Randi currently resides in New York’s famed Chelsea neighborhood where she is inspired by art and fashion every day. Previous Previous post: Layering – It’s A Fall Thing. Putting It On.